Montgomery County DOT convened a public workshop on the Bradley Boulevard Improvements project on March 23, 2015. The open-house style workshop allowed people to view project plans, ask questions, and make comments to DOT staff. The project would convert Bradley into a “dual bikeway” having both bike lanes and an 8′ shared use path. But it’s not just a bikeway project. It would make major drainage improvements and add an additional sidewalk, representing a significant share of the cost. For additional information, see the MCDOT official project description. Typical cross-section of the project, provided by MCDOT. The eastbound bike lane width may be different than shown. 5′ wide bike lane on the north side, 5.5′ wide bike lane (including gutter) on the south side. Only the south side would have a curb/gutter. These are the minimum required widths to comply with county standards. 8′ shared use path on the north side. County standards call for 8′ – 10′, with 10′ preferred. The project would also improve the Wilson Lane intersection by adding proper turn lanes. The easternmost block of the project, east of Kennedy Drive, would not get bike lanes. That section currently has no shoulders or bike lanes, but the road abruptly widens to five lanes as you approach the section (six if you count the westbound lane used for parking) so it’s fairly comfortable for cyclists to “take” the lane. That stretch is an ideal candidate for mid-lane sharrows. The reconfigured road would have to adhere to the county’s newest SWM standards, which reduce the flow of sediment-laden, warmed-up water into county streams by filtering it through the soil instead of dumping it into storm drains. But such systems take up space — in this case a wide swale between the roadway and the path. Such drainage improvements are required for projects that significantly alter a road, but are justified here anyway due to existing drainage problems. The improvements are included in the cost estimate for the project. The one mile project is nearing the end of Facility Planning Phase 2, at which point design will be 35% complete. Then the County Council must decide whether to fund the full project. If the project doesn’t happen, cost may be the culprit. The latest rough estimate is $11 to $12 million for one mile of improvements. Provide the bike lanes and shared use path, but not the sidewalk on the south side — Instead of building two walkways on Bradley, use the money to add a sidewalk along a road that doesn’t have one yet. But then accessing eastbound bus stops may require crossing the street where there’s no crosswalk. Provide the bike lanes and one sidewalk but not the shared use path – Reduces expense, but saves only 3′ of pavement compared to a single path while failing to serve off-road cyclists. If sidewalk is on the south side, it might eliminate the need for expensive drainage changes, but would have other drawbacks. Provide the bike lanes and two sidewalks but not the shared use path – Saves only 3′ of pavement compared to the DOT solution while failing to serve off-road cyclists. Provide a one-way cycle track on each side instead of bike lanes, as well as a single sidewalk but not the shared use path – Due to the buffer, cycle tracks would require an extra foot on each side compared to bike lanes, but create a more comfortable on-road cycling experience, possibly alleviating the need for a full path. Provide only shoulders having the same dimensions as the proposed bike lanes, without any path or sidewalk – This can be achieved at vastly lower cost by just restriping the road, possibly with a few spot widenings at pinch points. Marking them as shoulders rather than bike lanes allows pedestrian use. Because many cyclists use the Bradley shoulder now, the street must continue serving on-road cyclists but under safer conditions. Thus all of these alternatives have bike lanes or shoulders. DOT was considering only three options as of October 2010, shown here. They selected the third of their three options, but with slightly wider bike lanes. “It’s too much pavement” — The street itself would not be widened. 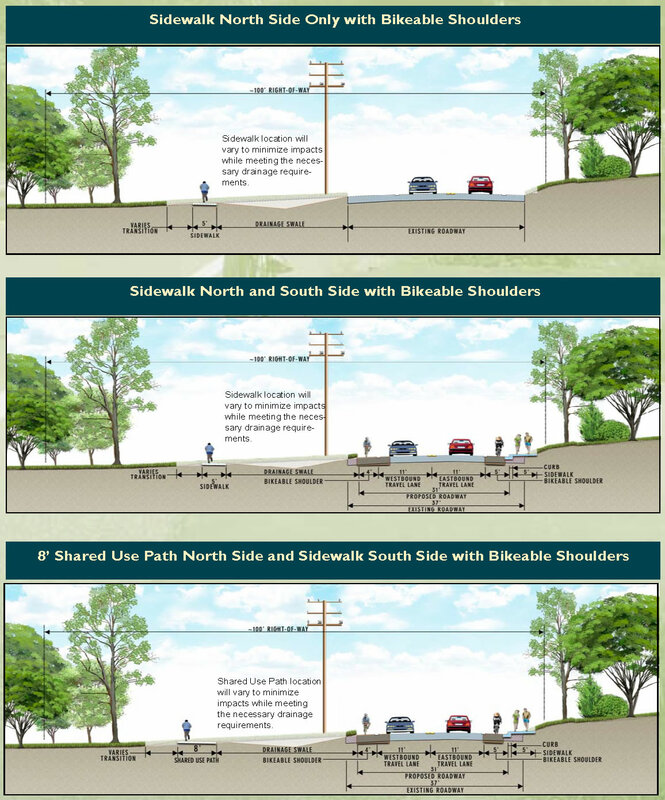 The sidewalk on the south side would add only 5′ of pavement, and the path on the north side would be far from the roadway. “It will take up too much of my yard” — All the improvements would be placed in the state right-of-way, even if residents consider it part of their front yards. Front yards on the south side are very small, so if any part of the project were canceled due to residential impacts, it should be the sidewalk on the south side. “I won’t be able to back out of my driveway because of all the cyclists and walkers” — This is tantamount to saying arterial roads lined with homes shouldn’t serve all travel modes because all the cyclists and pedestrians (but not the thousands of fast-moving cars) would make it too hard to back out. Realize that many cyclists using the new facilities would otherwise be driving. To the extent there would be path/driveway conflicts, surely it’s the path users who merit our concern. To help cyclists avoid such dangerous conflicts, it’s important to provide bike facilities besides shared use paths along roads that have numerous driveways and cross streets, which is why the project includes bike lanes. “Bike lanes are bad for bicyclists” – See below. One cyclist cited vehicular cyclist arguments against bike lanes or equivalent shoulders (cycle tracks must be an abomination then). He said it’s better for cyclists and drivers to travel collaboratively on Bradley and he proposed 3′ or 4′ wide shoulders instead of bike lanes to reduce car speeds. He said cyclists who don’t like it can use the shared use path. But I find Bradley to be good candidate for bike lanes because it’s a long roadway where cyclists are not likely to be making many turns, yet traffic is not so fast that a physical barrier is required. Traffic is fast and heavy enough that total lack of shoulders would deter all but the boldest cyclists, and 3′ – 4′ shoulders would be unsafe yet do little to reduce car speeds. 3′ – 4′ shoulders are a problem given the 11′ wide buses that ply the road and the fact that striping inaccuracy and edge deterioration can easily take away a foot. This would force many cyclists onto the path to deal with the driveway conflicts likely to occur there. If Bradley had no shoulders at all, with just enough pavement for two buses to pass each other, speeds might drop by a few miles per hour, but many drivers would still speed in their Autobahn-ready sports sedans with little time to react to cyclists encountered around blind curves. The idea that drivers and cyclists can happily get along on a commuter artery without any way to pass is a highly doubtful, if the long history of driver-cyclist animosity on MacArthur Blvd is any guide. (MacArthur is also a cautionary tale about 3 foot shoulders). I support the full solution proposed by MCDOT, but cost estimates should be developed for the other options in case the full solution can’t feasibly be funded. Note: If you post a comment and it’s not approved within an hour, please send a blank email to email@mobike.org with the subject “approve”. WordPress is having difficulties – sorry for the inconvenience. The above Public Reaction summary neglects to include the concern voiced by myself and several other neighbors regarding the safety of pedestrians attempting to cross Bradley Boulevard. Currently there are only a few unmonitored, poorly marked cross walks that are routinely ignored by vehicular traffic. If, as mentioned above, the sidewalks on the South side of Bradley should be eliminated from the plan, there would be no safe way for those living on the South Side Courts to walk to one of these (highly unsatisfactory) “crosswalks” let alone cross Bradley from their court. Once again, we ask that a way of slowing and controlling traffic be incorporated into the plan, whether it be speed cameras, flashing lights, additional signaled crosswalks, and/or speed control mechanisms (bumps,etc). I don’t know if it’s a consolation, but even if no sidewalk were added on the south side, the project might be a slight improvement with respect to your issue because you could walk in the bike lane on that side rather than walk in the existing narrow shoulder. I realize that’s not ideal, either for cyclists or pedestrians.